CILT is responsible for UCT’s rapidly growing lecture recording service, and over the last two years has been working with a group of UCT Computer Science students to solve some tricky problems using video and audio processing algorithms. Negotiating learning and identity in higher education by Dr Bongi Bangeni and A/Prof Rochelle Kapp, is the latest addition to the collaborative books produced jointly by CHED and other faculties at UCT. Visit the Research Projects page on our website, which features current and completed projects led by CHED researchers. 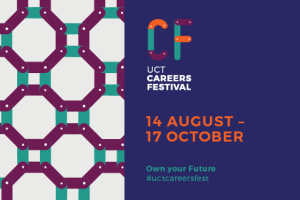 Awareness of the UCT Careers Service increased in second semester 2017 by consolidating over 40 events into a “festival of work” over a period of 6 weeks. Attended by over 1300 company representatives from 193 companies and estimated to reach over 15 000 students across platforms.